What Lego is to brick building, Schleich is to play figurines. The name is synonymous with excellent quality and attention to detail. You can keep adding to your collection one figure at a time till you have an entire set to play with. And no matter how many you have, there is always room for another Schleich animal in the toy box. The latest additions to the large range are the majestic Lion (RRP £5.99), the Indian Rhino (RRP £7.99) and the Black Bull (RRP 7.99). 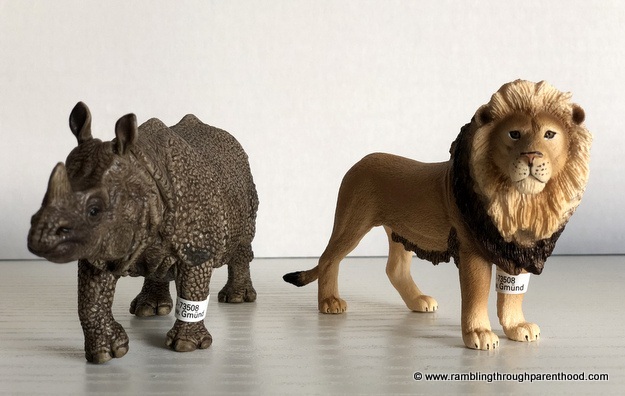 As with all Schleich products, these figures are well-made and are a good size. They are chunky enough for little hands to hold and play with. They are sturdy and look geared to withstand rough handling. Most importantly, they are perfect for play-based learning in the pre-school age group. 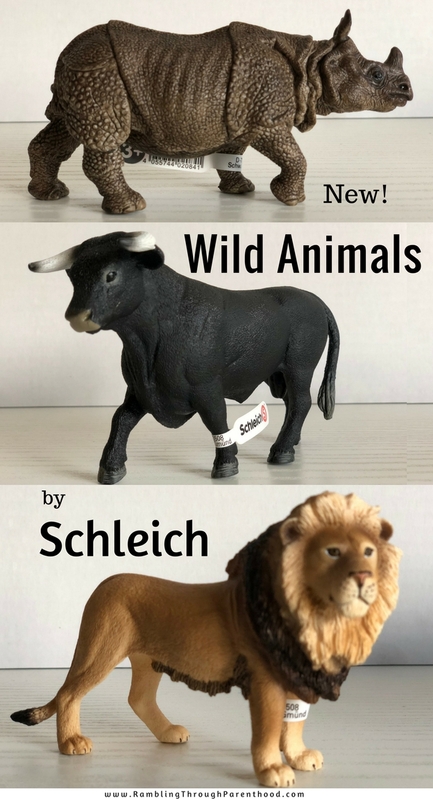 You can buy these and other Schleich figurines from their Amazon shop right now. Just head over to the Amazon marketplace via the picture link below to complete your purchase. The rhino stands out for me because of the intricate details of its leathery hide. The skin folds, the texture and the contours are brilliantly detailed giving the figure an almost life-like air. The lion too is striking, with its piercing eyes and textured mane. As for the black bull, the curve of its horns and tail are a warning that this creature means business! 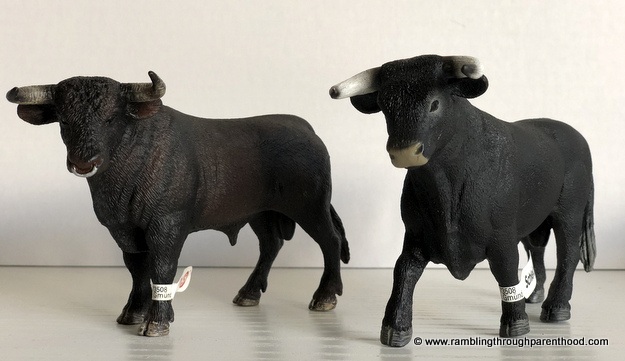 These new Schleich figures fit in with our collection and go particularly well with the Cave and Wildlife Starter Sets we reviewed a while ago. J wants to take these lovely new wild animals to school for show and tell. Their theme this half-term is Safari, and the lion, rhino and bull fit the bill perfectly. Disclosure: We were sent these Schleich figures for the purpose of this review. All opinions are my own.